If occupation by Armenia ceases, Azerbaijan could contribute to South-South cooperation more actively, Azerbaijani Foreign Minister Elmar Mammadyarov said, Trend reports citing the country’s Foreign Ministry. 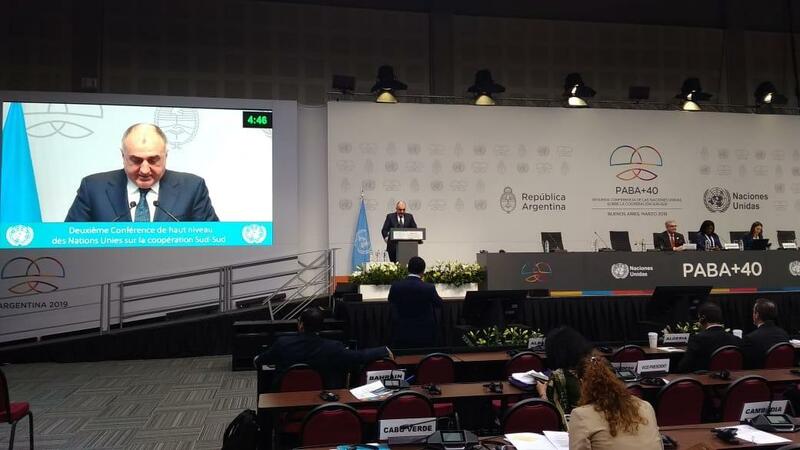 He made the speech at the plenary session of the Second High-level UN Conference on South-South Cooperation in Buenos Aires, Argentina. "Mr. President, Excellencies, Distinguished Delegates, Ladies and Gentlemen,I am privileged to address the Second High-level United Nations Conference on South-South Cooperation, which is a timely opportunity to assess what has been reached so far, where we stand and what South-South cooperation can do to tackle the development challenges. At the outset, I would like to thank the Government and the people of Argentina as a host country for warmly receiving us here in Buenos Aires. I would like also to express gratitude to the President of the General Assembly, the President of the High-level Committee on South-South Cooperation, the Co-Facilitators and all delegations for their outstanding support in this process," he said. Minister noted that üe have gathered here to commemorate a historical event in advancing the South-South cooperation. "The United Nations Conference on Technical Cooperation among Developing Countries, held in this city in 1978, was a major landmark in the continuing efforts of the United Nations to promote economic and technical cooperation among developing countries. This meeting is an occasion to reaffirm the continued relevance of South-South cooperation to build a more equitable global partnership for development and peace. As we are all aware, South-South cooperation is an expression of South-South solidarity that had proven its relevance by a rapid growth. It is a rising and dynamic phenomenon, an important process that is vital to confront the challenges faced by developing countries, making an increasingly important contribution to their development. In the light of the processes of globalization and deepening interdependence among economies, strengthening of South-South cooperation has become a major imperative both as a development strategy and as a means for ensuring that developing countries participate fully in international economic relations, which is a key objective of the United Nations," minister said. He noted that the rapid economic growth of some major developing countries has, indeed, dramatically improved the development prospects of neighboring countries, spurring economic growth and South-South trade and investment. "Today, developing countries have accumulated varying degrees of capacities and experiences in development that can be shared on a South-South basis. Global partnership as agreed in Goal 17 would be crucial for meeting the challenges of developing countries. The construct of South-South & Triangular Cooperation requires that developing countries have the policy space for their own development. The South-South learning and policy coordination and the peer-to-peer transfer of expertise and technology are effective ways to accelerate sustainable development. In other words, developing countries face similar development challenges. Therefore, the proximity of experience and methods allows sharing common views on national development strategies and priorities. Our approach to South-South Cooperation has been therefore to share this experience and knowledge in a spirit of solidarity with countries from the South treading similar paths of socio-economic development. Drawing on our own country, we understand the essential role of South-South cooperation in the provision of collaborative frameworks and cross-border and interregional programmes, as well as standards, regulatory arrangements and implementation mechanisms. Having joined the 2030 Agenda for Sustainable Development, Azerbaijan is currently intensifying its efforts to align national development strategy with the global Sustainable Development Goals (SDG), while translating them into national policies and programs. Building inclusive and resilient growth, moving from oil based to a more diversified economy, continuing investment in human development, and ensuring greater connectivity to regional and global markets to fully unleash Azerbaijan’s export potential are among the top priorities for the Government," he said. According to him in order to ensure effective implementation of SDGs and their regional coordination, Azerbaijan in cooperation with the UN Country Office organized Baku Forum on Sustainable Development last year to discuss the means of implementation of the national sustainable development agenda, share relevant knowledge and experience and learn best international practices related to SDGs. "Attended by the officials responsible for coordination of SDGs implementation at the national level as well as UN representatives, international and local experts, the conference adopted “Baku Principles” for National SDG Mainstreaming and Acceleration, which can serve a good basis for knowledge-sharing. The national stocktaking exercise on “Trends and opportunities in advancing South-South and Triangular Cooperation in Azerbaijan” conducted by the UN Country Office and the UN Office on South-South Cooperation in 2016 suggests that Azerbaijan has a comparative advantage in sharing its expertise in various fields of development, such as effective public service delivery, education, labor and social protection, youth empowerment, mine action and others. It should be noted that pursuing prudent economic policy, Azerbaijan has made a rapid social-economic success during the last 15 years, which transferred our country from recipient to a donor. The social-economic growth was followed by increasing appeals to Azerbaijan from foreign governments and international organizations for humanitarian aid and development assistance. To respond to these requests in a timely and well-coordinated manner, the national donor institution – the Azerbaijan International Development Agency (AIDA) was established within the Ministry of Foreign Affairs of Azerbaijan in 2011," Mammadyarov said. Minister noted that since its inception, AIDA has being employing multiple mechanisms to address poverty eradication and sustainable development in developing countries through building the human and institutional capacity, sharing good practices and experiences in a manner consistent with their national and strategic plans. 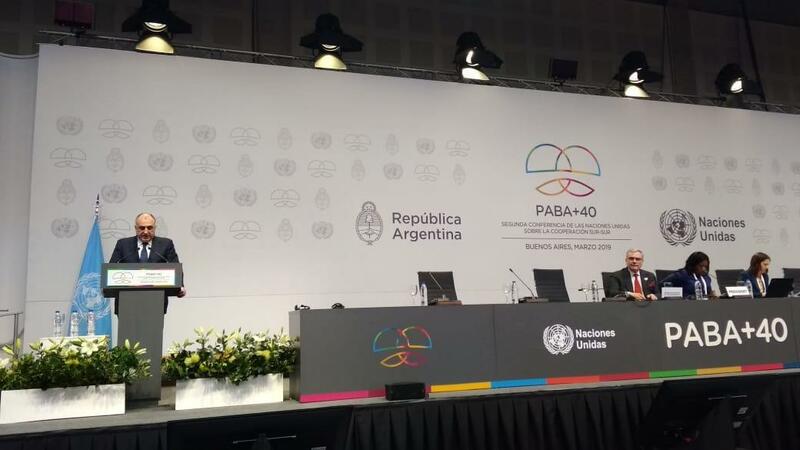 "During the past years, over 90 countries, especially those in Africa, Asia and Latin America have so far benefited from technical assistance and humanitarian aid programs delivered bilaterally and multilaterally by AIDA. We have helped nearly 2 million people, and the number of beneficiary countries and the volumes of provided aid are constantly growing. One of the vital importances of the new donor countries, such as Azerbaijan, is that they present new vital sources for replenishment and reversal of declining trend of Official Development Assistance (ODA), which is extremely important for sustainable development of vulnerable economies, such as LDCs, LLDCs, and SIDS. They also serve as an example and encouragement for other developing countries that consider the possibility of joining their ranks and becoming donor countries themselves. However, Azerbaijan represents an interesting example of a donor country. We provide international assistance under the circumstances when 20 percent of our territory has been under the military occupation of Armenia for over 2 decades, as a result of which more than 1 million people have become refugees and IDPs. Yet, Azerbaijan has succeeded in recovering, diversifying and modernizing its economy, while reducing poverty level from 49 to 5 percent. Most importantly, having effectively integrating both refugees and IDPs into the society, Azerbaijan has accumulated a vast experience in providing them with adequate shelter, health and education services, employment, while strengthening their human capital, which could serve as possible areas for the South-South cooperation," he said. Minister stressed that aside from being a donor country, Azerbaijan has also become the leading economy in the region and the initiator of large-scale regional projects, and if the military occupation by Armenia ceases, Azerbaijan could contribute to South-South cooperation more actively. "We recognize triangular cooperation as a modality closely linked to and supportive of South-South cooperation, which brings an added value by leveraging and mobilizing additional technical and financial resources, sharing of experiences and flexible arrangements between Southern and other partners. Azerbaijan signifies the role of taking concrete and practical steps to stimulate and enliven the cooperation and economic integration in the South-South direction. We believe that the Non-Aligned Movement is one of the most relevant venues to discuss and define the ways and mechanisms for such cooperation. During its chairmanship to the Movement starting from October 2019, Azerbaijan will do its best to explore new opportunities in this direction," Mammadyarov said. Minister noted that Azerbaijan believes that one such opportunity lies in the heart of ensuring inclusive and equitable quality education and promoting lifelong learning opportunities for the youth from the developing countries. "With the orders of President of the Republic of Azerbaijan, H.E. Mr. Ilham Aliyev, last year my country has adopted full scholarship programs for 2018-2022 that would annually enable 40 students from Member States of Non-Aligned Movement and Organization of Islamic Cooperation to obtain higher education at the universities of Azerbaijan. The five-year program is expected to contribute to strengthening of the human capital and the fulfilment of sustainable development goals in the OIC and NAM countries. In addition, Azerbaijan attaches high importance to applying innovative technologies in public administration to promote effective public services and realization of the Agenda 2030. In 2018 the UN Human Rights Council has unanimously adopted a resolution on “Promoting human rights and SDGs through transparent, accountable and efficient public services delivery” at the initiative of Azerbaijan. This resolution highlighted the vital importance of public services as one of the key areas of meeting the standards of human rights while achieving the SDGs. It also promoted the concept of ASAN public service delivery brand of Azerbaijan, which received the UN Award in 2015 for successful public delivery that can serve as one of the areas among countries for South-South cooperation. Detailed information about what Azerbaijan offers for international cooperation in general can be obtained from the Azerbaijani stand in the South-South Cooperation Expo 2019 to which all the esteemed participants are cordially invited. In conclusion, I would like to remind that the strategic partnerships harness the collective experiences towards a common goal while increasing the pool of resources and that strong partnership among countries of the South supported by the UN system will help unlock the economic potential of the developing countries and benefit the entire international community. This Conference will certainly contribute to further strengthen South-South cooperation".